The Walt Disney Company is acquiring a portion of 21st Century Fox that was put up for sale by the Murdoch family and the ramifications are going to be huge for the entertainment industry. The $52.4 billion all-stock deal was announced earlier today, but had been rumored for weeks. The news comes after Disney announced its plans to start its own streaming service, which has now just acquired a bunch of new movies and TV shows that will now more than likely be exclusive to the new streaming service. And Disney just got their hands on some pretty legendary TV shows. Obviously the big one here is The Simpsons, which the show actually predicted back in 1998. The episode is When You Dish Upon a Star and it gets even better when Ron Howard is shown pitching an idea for a Star Wars movie. Though Disney probably won't deal with the day to day dealing of Fox, they will have the power of syndication and The Simpsons are one of the hottest properties around. Disney will obviously make a killing off of The Simpsons alone as the show heads into its upcoming, unprecedented 30th season. Futurama is also said to be included in the merger. Family Guy is next on that list and is also a huge deal for syndication. The Seth MacFarlane created show is still going strong, currently in its 16th season after getting revived by Fox in 2005. We probably won't be seeing Family Guy characters roaming around Disneyland, but this is an extra step for the Mouse House to get into a little bit more of the risky type of material. And as Bob Eiger said, they are already thinking about a rated-R type of wing that will see the likes of Deadpool continue on in the future. The X-Files is another big one for Disney to acquire. 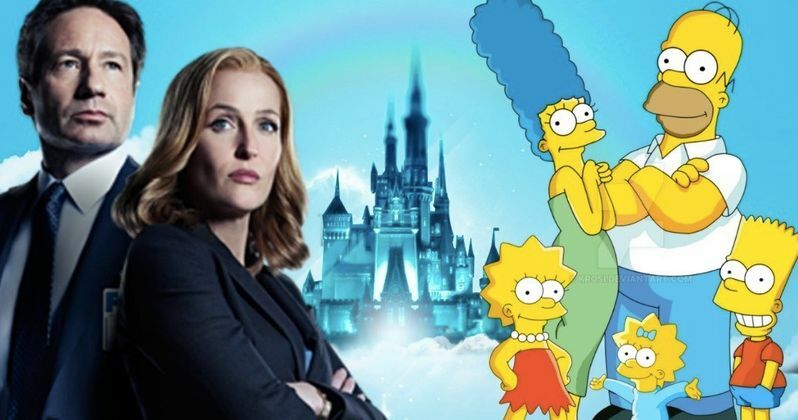 It's hard to think of Mulder and Scully as being Disney-owned, since the iconic show has been synonymous with Fox since its inception in the mid 1990s. In another twist, Disney now also owns This is Us, Buffy the Vampire Slayer, Empire, Homeland, The Orville, American Horror Story, The Gifted, Legion, Modern Family, and 24. When Disney launches its streaming service, they are going to be gutting Netflix and Amazon with a grip of some of the most iconic shows ever to be seen on television. In addition, Disney just acquired Fox Regional Sports Networks, which is valued at $22.4 billion alone. Disney now has Prime Ticket, Fox Sports West, Fox Sports San Diego, the YES Network, and many more. While Disney-owned ESPN has rights to a variety of national broadcasts for professional baseball, football, basketball, as well as major Division I college sports, it's less deep on regional games. Fox's networks would help make ESPN's planned 2018 streaming service more attractive to sports fans that want to cut the cord and ditch their pay TV service. Regardless, Disney has just stepped up their game considerably and comes on the very same day when the FCC holds a vote about Net Neutrality. You can read more about the Disney and Fox merger courtesy of USA Today. Here's the full list of TV shows Disney now owns from Fox.